Wake up! Wake up! The Year of the Rooster will soon be upon us! My grandfather lived on the countryside in his retirement. When I was little, I sometimes stayed over at his place. 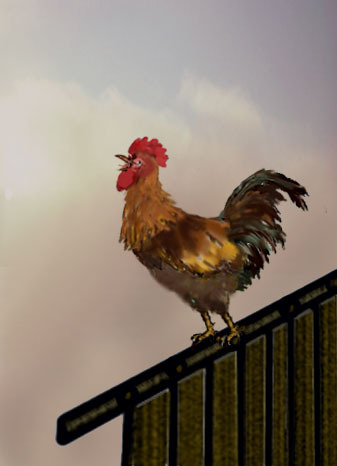 Every morning, the neighboring farmer’s rooster would hoist himself on the roof of the chicken coop, stretch his neck out as far as it would go and let out a series of three-syllable “O-O-O” cries to wake everyone up, his face red from the excessive straining. To the Chinese, the rooster is far from being “chicken”. Rather, it is the symbol for diligence, dutifulness and righteousness. Naturally, a bit of cockiness goes with that as well. 鸡 (jī) refers to all chickens. 公鸡 (gōngjī male chicken) is a rooster and 母鸡 (mǔjī female chicken) is a hen. Little chicks are called 小鸡 (xiǎojī). Please note that 田鸡 (tiánjī) is not a field chicken, but a frog. 啼 (tí) is to crow, to cry or to weep aloud. Zǎochén tīngdào gōngjī tí jiào. In the morning I hear the rooster crowing. In the evening I hear the baby crying. When talking about the eyes of chicken, say 鸡的眼睛 (jī de yǎnjing) rather than 鸡眼 (jīyǎn) as the latter refers to a corn that could form on one’s feet. It is interesting that the Chinese talk about chicken bumps, 鸡皮疙瘩 (jīpígēda), rather than goose bumps. 鸡毛 (jīmáo) is chicken feather, light and insignificant. Therefore 鸡毛蒜皮 (jīmáosuànpí chicken feathers and garlic skins) means trivial things. In ancient China the army made use of an arrow-shaped token of authority. Whoever saw this 令箭 (lìngjiàn) must obey the order the carrier read from it. Now, if you don’t look closely, you might mistake a large rooster’s tail feather for that arrow-shaped token. Therefore the idiom 拿着鸡毛当令箭 (ná zhe jīmáodānglìngjiàn) is often used to describe a situation in which a person makes a big fuss about a superior’s casual remark and justifies actions that lead to undesirable results. This idiom also applies to a person who takes advantage of other people through false authority. As the rooster’s tail is made up of multiple feathers of different colors, a mixed alcoholic drink is called 鸡尾酒 (jīwěijiǔ cocktail). 鸡蛋 (jīdàn) are chicken eggs, and we all know that eggshells are quite fragile, hence the idiom used in the following sentence. This is like knocking an egg against a rock (no chance to prevail). Normally eggs sold at the market would not come with bones. However, a nitpicking person might still pick an egg over and try to find a bit of bone in it. The action of intentionally trying to find trivial faults in others is referred to as 鸡蛋里面挑骨头 (jīdàn lǐmiàn tiǎo gútou). 首 (shǒu) is the classical word for the head or a leader. When pronounced in the second tone, the word 为 (wéi) means 是 (shì to be). Would you rather be the leader of a small company than a minion in a large corporation? If so, the following saying reflects your mentality. Níng wéi jī shǒu, bùwéiniúhòu. I’d rather be the head of a rooster than the behind of an ox. 鸡犬不宁 (jīquǎnbùníng) describes general turmoil, in which even fowls and dogs are not at ease. This idiom can be used to describe wartime or a disturbed condition at home. Tāmen dòngzhé chǎojià, nào de jiā lǐ jīquǎnbùníng. They quarrel frequently, upsetting the entire household. As you can see from the above two sentences, the word 宁 (níng) can stand for. 宁愿 (nìngyuàn prefer, would rather) or 安宁 (ānníng peaceful, calm). Chickens are not known for their physical strength. 手无缚鸡之力 (shǒuwúfùjīzhīlì lacking the strength to truss up a chicken) is an expression used for describing a weak person. Last year we talked about 杀鸡儆猴 (shājījǐnghóu), which means to kill the chicken to frighten the monkey. This method of warning by example has often been employed in the political arena. 杀鸡取卵 (shājīqǔluǎn kill the hen to get the egg) is the equivalent of the western saying: “Kill the goose that lays the golden eggs.” Let’s not be shortsighted, but spare the poor hen. Failed to steal the chicken and lost the grains of rice. A wooden chicken is stiff and unable to move. The Chinese use this term to describe a person who is stunned, dumbfounded or transfixed with fear or amazement. Tā zhàn zài nàr, dāiruòmùjī. 落汤鸡 (luòtānjī) means a drenched chicken, another chicken expression used for describing a person. Yǔ xià de hěndà, bǎ tā lín de xiàng zhī luòtānjī. There was a downpour, and he was drenched through. Please note that the unit to use when referring to most animals is 只 (zhī), rather than 个 (gè). Therefore, you would say 一只鸡 (yī zhī jī) and not 一个鸡 (yīgè jī). For a discussion of the commonly used units of measure in Chinese, please see Chapter 6 of “Learn Chinese through Songs and Rhymes”. As you may have found out, many of the four-character Chinese idioms are based on legends, anecdotes or historical events and personages. Therefore one should be careful not to take them at face value. For example, 聞雞起舞 (wén jī qǐ wǔ) does not mean “Smell the aroma of the fried chicken, get up and dance with joy.” Here, 聞 means to hear, and 舞 stands for 舞劍 (wǔ jiàn), i.e. practicing martial art using a sword. The idiom 聞雞起舞 (wén jī qǐ wǔ) is based on an anecdote about a famous general, 祖逖 (Zǔ tì), of the Jin Dynasty who rose at the crack of dawn each day to do physical exercises to strengthen his body. This general was a fine example of diligence in one’s studies and self-improvement. If you assume this attitude in studying Chinese or any other subject, you should see good progress in due time. Are you ready to celebrate the Chinese lunar New Year? I think the lively song at this link will help get you in the mood.